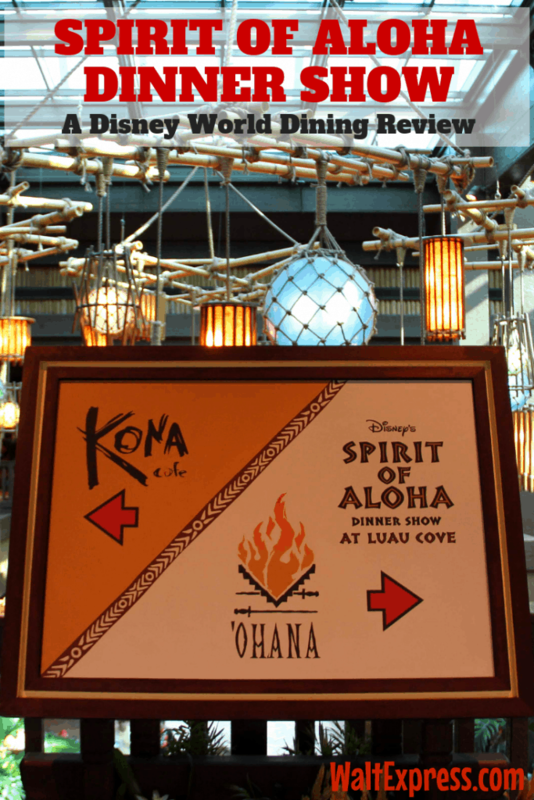 One of the best kept secrets at Disney World is the Spirit of Aloha Dinner Show at the Polynesian resort. This amazing show introduces you to Polynesian culture, food, and lots of fun! Keep reading to find out why you should give it a try on your next Disney World visit. This is one dining experience that you don’t want to miss! 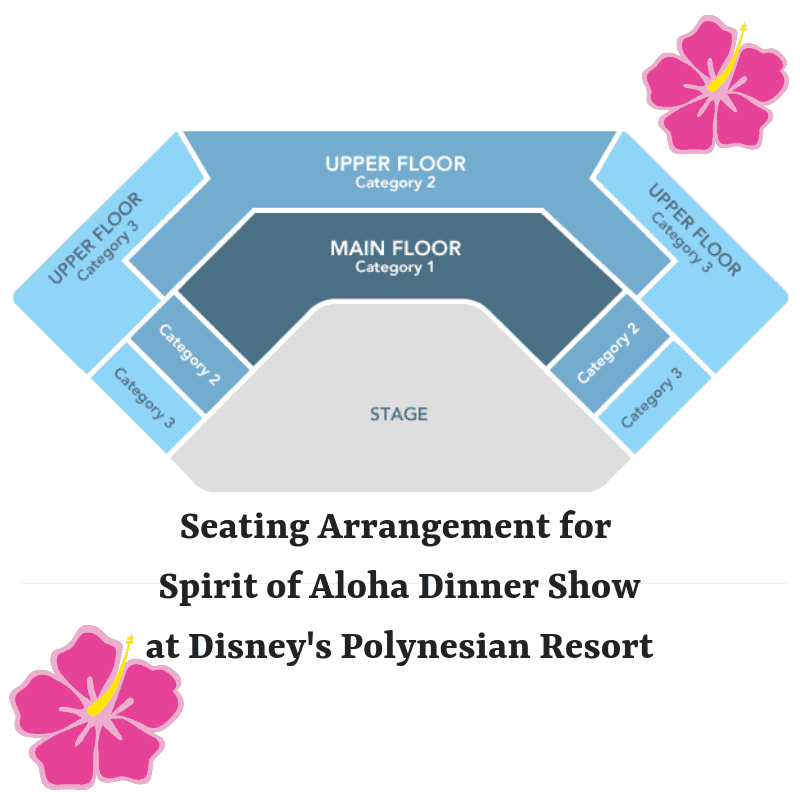 Find out why we love the Spirit of Aloha dinner show at Disney’s Polynesian Resort. The Spirit of Aloha is located at the Luau Cove amphitheater, and you are able to start soaking in island vibes before you ever get there. 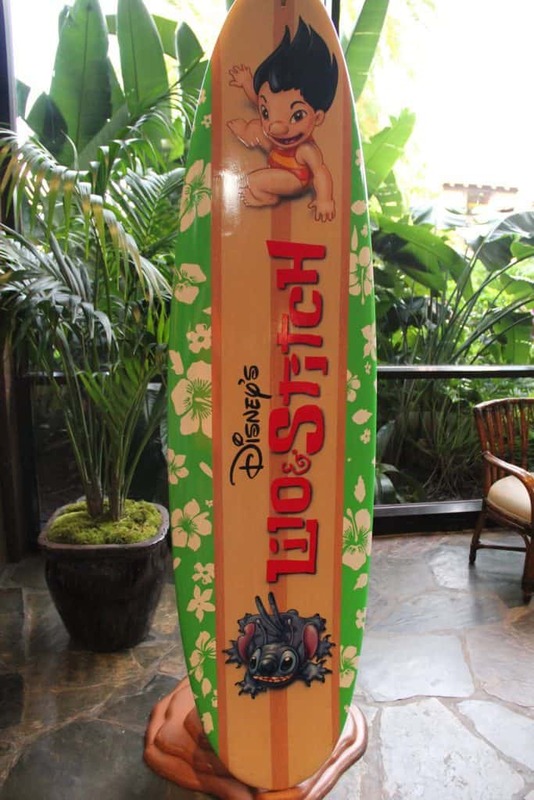 You’ll enter a tropical paradise as you walk through lobby of the Polynesian Resort and and make your way outside where you will walk near the shores of Seven Seas Lagoon and have an amazing view of the Magic Kingdom. 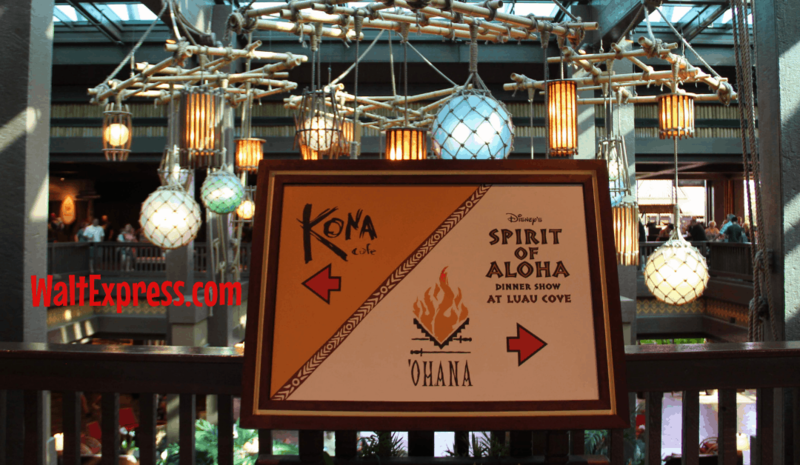 You simply need to keep following the signs until you reach the torch lit pathway that will lead you to Luau Cove! When you arrive, you are greeted like family and every member of your party will receive their very own lei. Your group will then be led to your seats by a Cast Member. Once you are seated, your server will come by and take your food and drink orders. Dinner at the show is served family style, which means that servers will bring you large platters of delicious pulled pork, ribs, roasted (or grilled) chicken, salad, rice, veggies and pineapple that everyone can share. Our kids especially loved the pulled pork and chicken legs. The best news, is that it is all-you-care-to-eat, so when the chicken legs ran out, our server brought us more! Also included in your meal: soft drinks, lemonade, coffee and other non-alcoholic beverages. Guests 21 years of age and up can enjoy beer and wine with their meals, included in the price. 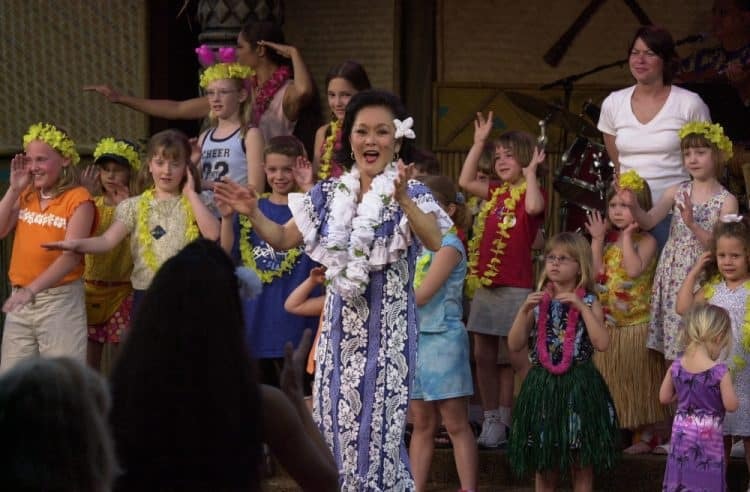 The Spirit of Aloha show is hosted by Auntie Wini, who is putting together a going away party for one of the local girls who is going to the mainland for college. 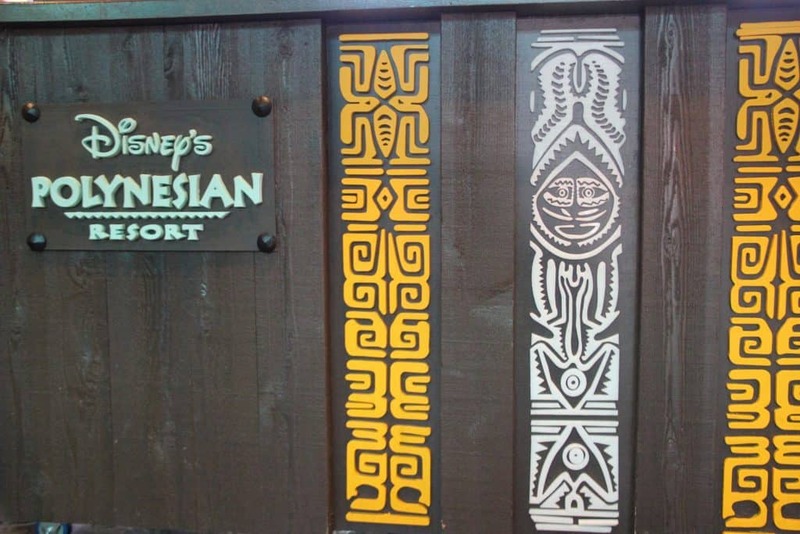 The show features a live band that plays the Polynesian inspired and traditional music that the cast members perform to. The show features not only musical numbers, but cast members performing Polynesian dances from all over the world while wearing traditional dress. The show wraps up with my personal favorite ─ some really impressive fire dancing! During the show, there are lots of opportunities for the audience to participate, making every minute you are in Luau Cove entertaining. At one point during the show, the entire audience is invited to come up and learn a dance with the cast members! This was my family’s very favorite part of the night and they’ve talked about it ever since. The main floor is reserved for customers who pay without dining plans, which runs $74 for adults and $46 for kids 3-9. If you love dinner shows and like experiencing new things, this is definitely the Disney World experience for you! You don’t want to miss out on this one! My entire family LOVED it! Have you experienced this tropical luau? We would love to hear about it in our Facebook Group, DISNEY EXPRESS LANE!